Tucked away along Northwest Florida’s Gulf Coast, Stallworth Preserve is for those discerning buyers who are looking for the ultimate in space, privacy and luxury. Situated in Santa Rosa Beach, it is in the heart of everything yet feels like it’s worlds away. If you’re yearning for long, uncrowded stretches of sand, this is the place for you. The Emerald Coast’s famed sugary white sand beaches have earned universal acclaim over the years and have received awards such as the “Best Beach in the United States” (USA Today), “Favorite Family Vacation Destination” (Southern Living Magazine), and one of the “Best Beaches on Earth” for families (Travel + Leisure). Stallworth Preserve is known to have some of the region’s grandest selections of waterfront mansions and exclusive beach villas. 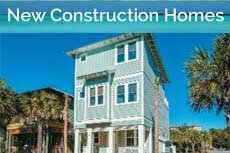 You can also opt for a lot and choose to have your dream beach home custom built instead. This intimate gated beach community only has over a dozen homesites, making it extra exclusive indeed. Apart from its unparalleled Gulf views, residents can also look out on the gorgeous and very rare coastal dune lakes that define this particular stretch of coast. Stallworth Preserve is caught right between the ocean and Stallworth Lake and Oyster Lake, two of the 15 named coastal dune lakes in South Walton. At Stallworth Preserve, everything is within easy reach while you stay luxuriously hidden away. You can truly immerse yourself in nature in your immediate surroundings here, what with the community being right next to the Topsail Hill Preserve State Park, one of Florida’s most beautiful natural reserves. Edged by more than three miles of white sand beaches, it encompasses over 1,640 acres and contains three coastal dune lakes as well as wetlands, old-growth trees, and more. While boating is not allowed inside the preserve, the lakes are superior spots for freshwater fishing, where you can catch bass, catfish and panfish. The preserve is also a paradise for hiking enthusiasts as its varying topography makes it a natural habitat for many colorful species of birds.